YouTube is one of the most popular video sharing sites. People can view, upload and share videos about autos and vehicles, comedy, education, entertainment, film and animation, gaming and many more. However, YouTube uses Adobe Flash (FLV) to playback videos. Most mobile devices and media player doesn’t support YouTube FLV format. While, AVI (Audio Video Interleave) is a popular file format that are supported by many mobile devices. That’s why you are recommended to download YouTube to AVI format if you want to watch them on portable device. With Aimersoft YouTube Downloader for Mac, save YouTube videos as AVI format is not a problem anymore. It can download YouTube videos with fast speed and then convert the downloaded YouTube videos to AVI and many other video format like MOV, MP4, 3GP, etc. as well. This YouTube to AVI downloader is easy to handle and doesn’t require any skills. Only by several simple clicks, you can save YouTube as AVI on Mac without any hitches. Windows users please make use of Aimersoft YouTube Downloader to download YouTube video to AVI. Just download this YouTube Downloader and follow the simple steps below to experience the pleasure of downloading YouTube videos to AVI format right away! 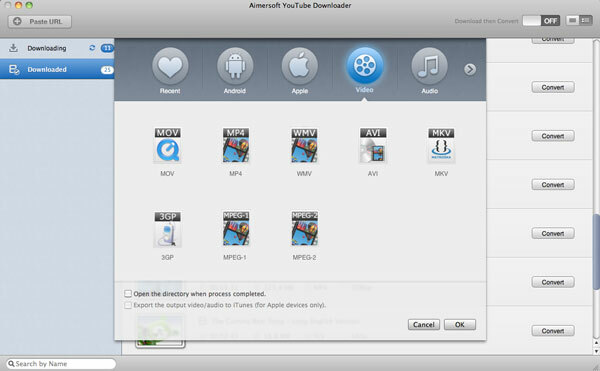 Download and install Aimersoft YouTube Downloader in your Mac. Note that the screenshots below are taken from the Mac version of YouTube to AVI downloader. OK, without further ado, let’s begin now! Run YouTube video downloader and turn on the "Download then Convert" button on top of the main window of this program. Choose AVI (in Video category) as the output format. 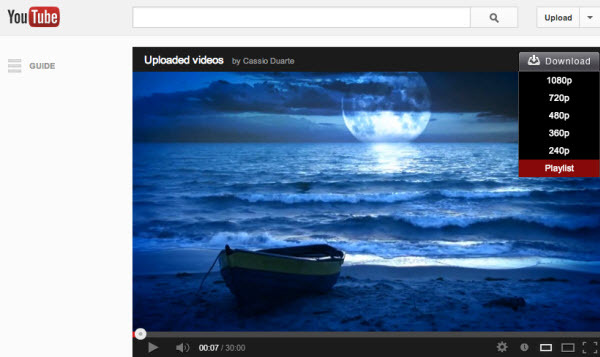 Tips: To easily find your downloaded YouTube videos, you can designate the location to store the videos. Click the program name (YouTube Downloader) on the left top side of the desktop of your Mac and click Preference from the pull-down menu. In the Location tab, click Change to browse the folder you want to save the downloaded and converted videos respectively. Of course, if you prefer to store all the videos in the default output folder, then you can skip this step. Open Safari (or Chrome, Firefox) and visit YouTube website. Search for the videos you want to download. Play it and there will pop up a Download button on the top right side of the video play widow. Click it and choose the resolution you hope to save the video as. When you done this, the video you are watching will be downloaded immediately. If you want to download all the videos in a certain playlist to AVI format, just click the Download button and choose Playlist to begin batch download YouTube videos to AVI. Tips: There are two other ways to start the downloading process. Simply copy the video URL (or playlist URL) and click "Paste URL" button on top of the program’s main window. Directly dragging and dropping the video/playlist URL to the window of this software is the other way.